Salman Khan, who was accused of killing two blackbucks in Jodhpur, has been granted bail after spending two days in jail. Fans not only got excited as 'Tiger' was back, many came up with hilarious memes to celebrate the moment. After spending two nights at the Jodhpur Central Jail, Salman Khan got bail in the 1998 blackbuck poaching case. The Bollywood actor was sentenced to five years imprisonment for killing two blackbucks in Kankani village, near Jodhpur — during the shooting of Hum Saath Saath Hain. A district and sessions court in Jodhpur granted bail to the actor – after being sentenced to five years of imprisonment in the case – on the condition that he will have to produce two sureties worth Rs 25,000 and a bail bond of Rs 50,000. Along with Khan – who was last seen in the movie Tiger Zinda Hai – actors Saif Ali Khan, Sonali Bendre and Tabu, were among the six co-accused in the case. However, it is just Salman Khan who has been held guilty. After the latest update, fans on social media could be seen exchanging happy thoughts about the acceptance of bail plea. Needless to say, many others have resorted to jokes and memes, and it will make you chuckle all day long. Check out some tweets on the micro-blogging site here. Salman Khan has done cameos in Judwa 2, Om Shanti Om and jail. I do not blame Salman Khan. the range of the rifle fire! Salman khan is out on Bail..
5th April- #SalmanKhan convicted, sentenced for 5 Years. 6th April- 87 Judges transferred, including the judge who was supposed to hear Salman Khan’s Bail Plea. 7th April- Salman Khan Granted Bail. 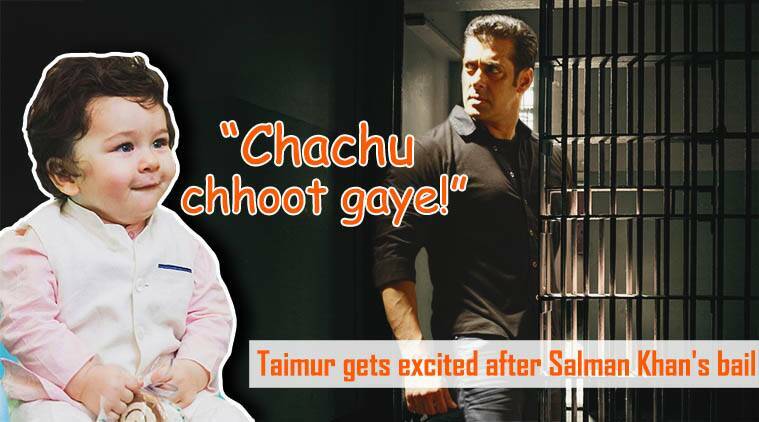 What do you think about the reactions to Salman Khan’s bail? Let us know in the comments below. 3 Salman Khan blackbuck poaching case: Netizens get chatty as 'Tiger' is back!